Fund Chairman Omali Yeshitela's trip to South Africa! Build the African Revolution! Hands off Panzi Hospital in Congo: Stop the violence against African women! Overturn imperialist definitions of our reality - Bring the people science! Bring the people the International African Revolution! Coup denounced! Resistance continues in Egypt despite neocolonial bloodbath! Education, healthcare and farming in Sierra Leone; Development in our own black hands! Uhuru Kenyatta wins neocolonial elections in Kenya, despite ICC pressure! British government leads charge to loot Africa! Down with Kagame, Museveni and Kabila! The imperialist war against Congo continues unabated! ANC repression can't stop workers' fight for a united, liberated, socialist Africa! Get George Bush out of Zambia! AAPDEP Nursing Institution needs your immediate support! ALERT: Chernoh Bah attempts to have Sierra Leone police arrest Uhuru Movement organizers! 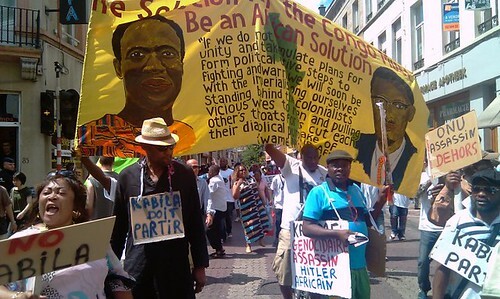 Parasitic corporations in Sierra Leone and their puppet facilitators must go! Pay Congolese doctors and nurses decent living wages. No more payments to World Bank and IMF! Mary Koroma, Director of AAPDEP Sierra Leone wins Biko Lumumba Comrade of the Quarter Award! Kongo lelo: mbongwana to nini? / Congo today: revolution or what? Sierra Leone organizing trip postponed until January, 2012: There is still time to contribute, donate today! $4000 needed to help send AAPDEP reps to Sierra Leone! Famine in Somalia caused by imperialism! Neocolonial crisis in Ivory Coast is a part of imperialism's crisis!